Grammy award-winning US singer-songwriter John Mayer claims he isn’t worried about writing hits any more. He insists that he no longer obsesses about dominating the charts. He now believes songs should focus more on being meaningful rather than simply having a catchy melody. However, when telling your own story it is important to make sure that your song is not too narrow and personal. Don’t be too insular. Ideally, the song should be written in a way that leaves the audience thinking the song is about them and their lives—not about you. People don’t really want to hear about your problems. They might, however, want to listen if your songs are about experiences, hardships and situations that everyone can relate to—such as a broken love affair, a personal tragedy, or a song about concern for the environment. By writing about something that everyone experiences in his or her own life, you can touch people’s emotions. If you can engage listeners’ minds and make them feel something, it’s the sign of a good song. On the subject of writing good songs, John Mayer urges new writers not to worry too much about whether a song is good or bad when they are writing it. “Just write it,” he says. “The rule is: write bad songs, but write ’em. If you start writing bad songs, you start writing better songs, and then you start getting really good. Take a look at this quirky lyric video for ‘Paper Doll’ from John Mayer’s sixth album Paradise Valley. “How [Not] To Write A Hit Song! 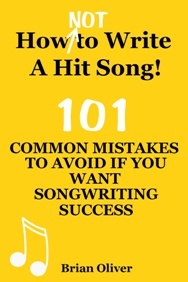 – 101 Common Mistakes To Avoid If You Want Songwriting Success” is available from Amazon as a paperback, or as an eBook from Amazon’s Kindle Store, Apple’s iTunes Store (Books/Arts & Entertainment/Music), Barnes & Noble’s Nook store, and Rakuten’s KoboBooks. “How [Not] To Write Great Lyrics! – 40 Common Mistakes To Avoid When Writing Lyrics For Your Songs” is available from Amazon and Barnes & Noble as a US paperback, UK paperback and as an eBook from Amazon’s Kindle Store. It is also available from Apple’s iTunes Store (Books/Arts & Entertainment/Music), Barnes & Noble’s Nook store, and Rakuten’s KoboBooks.